It’s often said the rural Victorian landscape is a patchwork quilt. Keely Letson sits and stitches it in the corridor between the campus art studios. Fat squares of canola yellow, reminiscent of her favourite view back home. The artwork will soon hang alongside the work of 21 of Keely’s peers for their final year exhibition. Keely came to Bendigo three years ago from her hometown of Cobram to follow her creative heart. She arrived with a love of detail and portraiture far from the sunny minimalist painting to accompany the patchwork. “When I first came to uni I didn’t understand the concept of abstraction or minimalism, but my teacher kept telling me that’s where I should head. Eventually I realised it too and thought, yes, he was right all along,” she says. Keely is on the top floor of the arts building with a handful of other students putting the finishing touches on their exhibition pieces. Other final-year students are packing up studios they’ve occupied for years. Melissa McArdle isn’t so ready to move on. It took her many years to finally get to university, and she’s determined a Bachelor of Creative Arts won’t be the end. “I wanted to go to uni when I was younger but it wasn’t an option with my parents,” she says. Instead she went into nursing, had a trio of babies and got on with life. 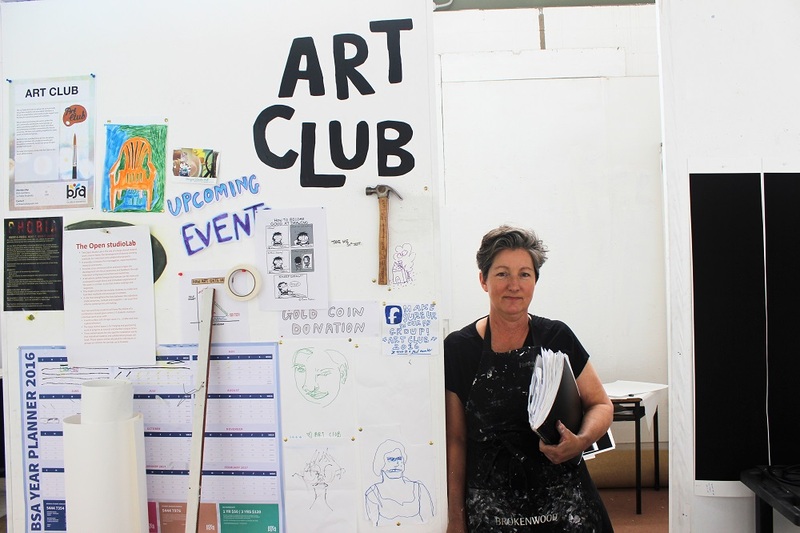 Then she enrolled in an art pathways course in her hometown of Castlemaine, which gave her the confidence to roll onto La Trobe. “The best thing about La Trobe has been making all those creative friends who are similar to you – meeting people just as wacky as you are,” she laughs. 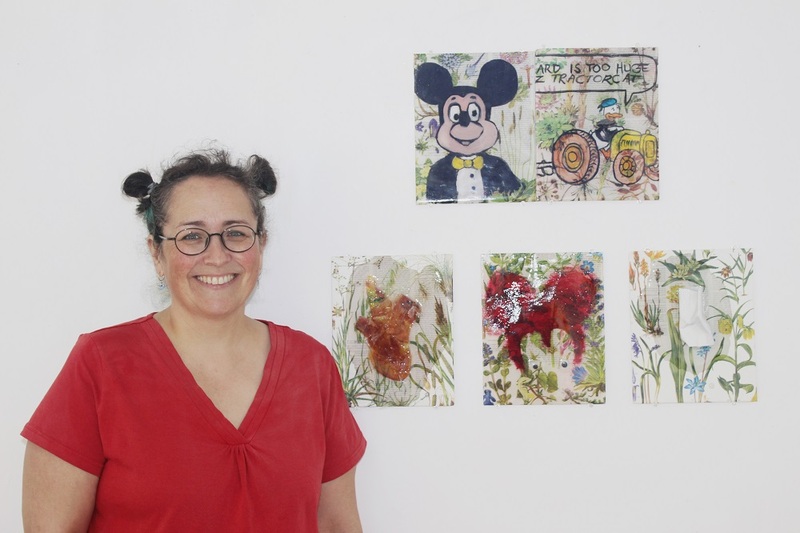 Case in point, her gorgeous Disney-inspired mixed media works, including ceramics and resin on mirrors. Melissa’s not ready to leave the facilities either, having made good use of everything, from the printmaking equipment to the kilns. 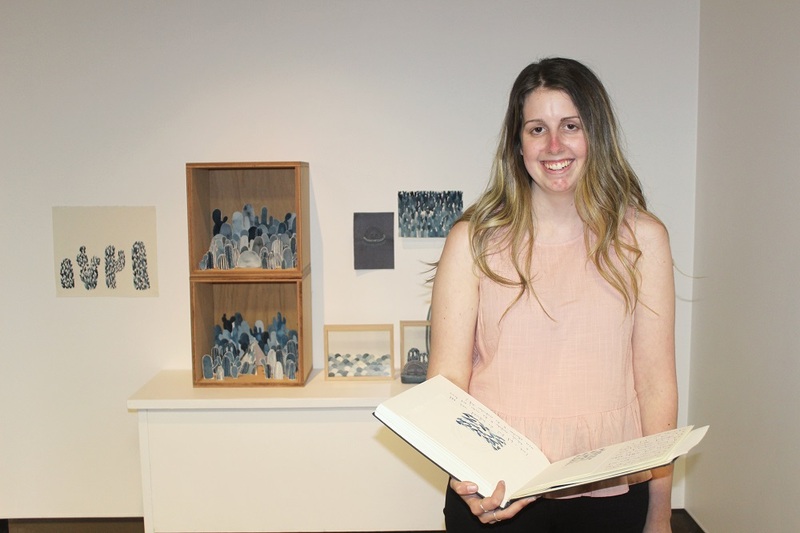 Bailey Bish is ready to wrap up her degree and explore her growing love of design and illustration, realised in Bendigo. 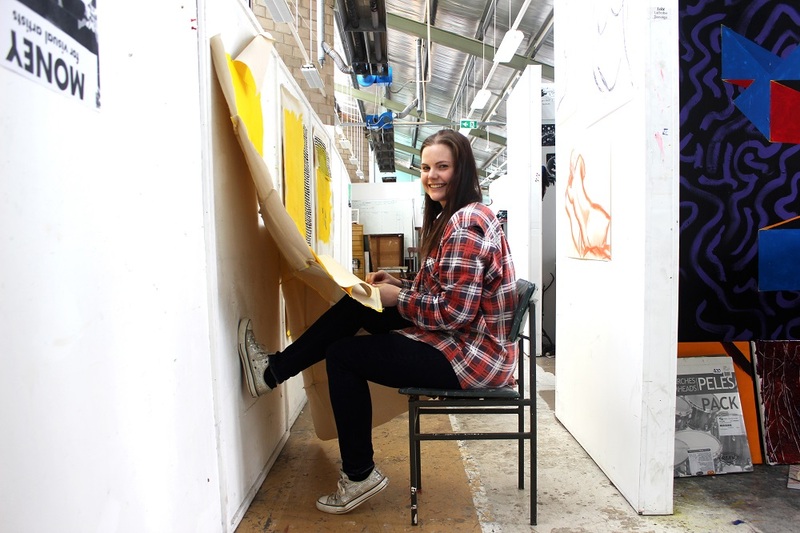 Bailey enrolled in the Bachelor of Creative Arts straight after finishing high school in rural Warracknabeal. 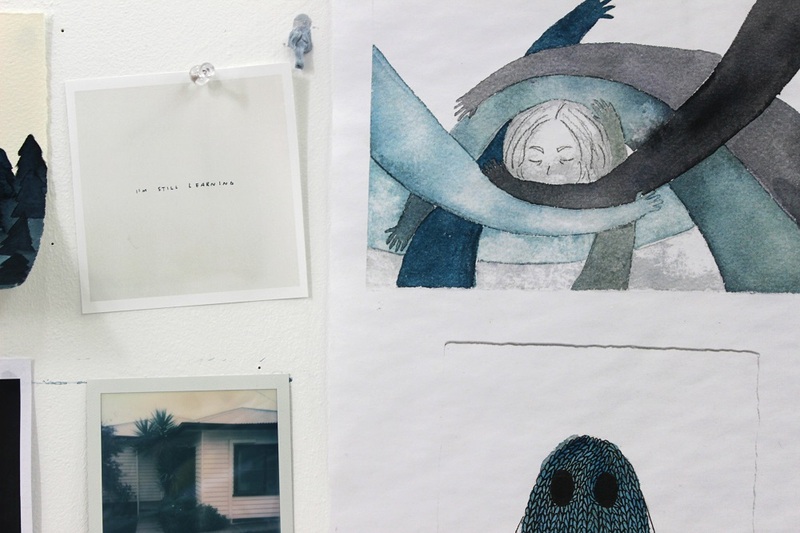 The inner drive to be artistic was strong, so Bailey found herself a creative mentor and developed a steely work ethic that will soon take her onto further study. 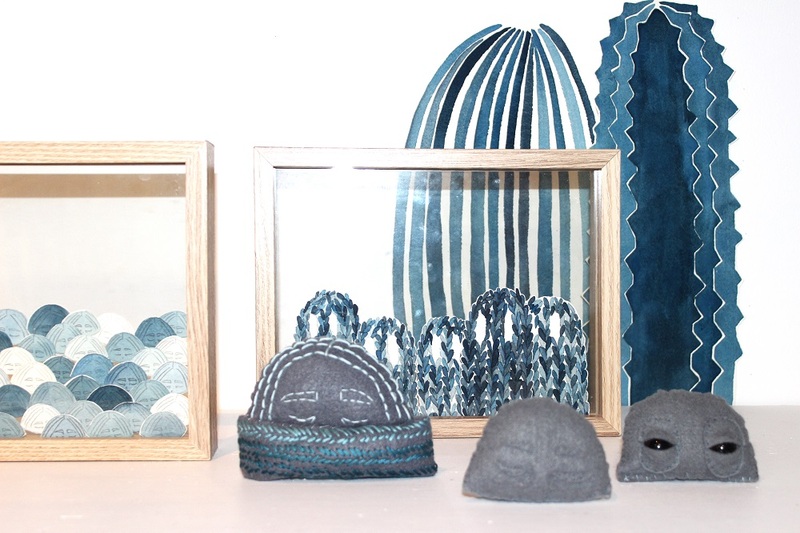 Her inky blue works of cut-out paper, illustration, paint and soft sculpture is unmistakingly ‘Bailey’. Look closely and you’ll see she’s literally put herself in the picture, her eyes peeping out. The essence of her is in there, too. We caught Benita Murray hanging up her hammer for the final time outside her white cubed studio. But she’s got another great space to go home to in Kyneton. Benita has been a practising artist for 20 years, since graduating from the Claremont School of Art in Western Australia. It’s also changed her medium, from rusted metal to crumpled paper. “I worked for 20 years in rusted metal. When I came here I decided to not do that anymore.” The paper work is paying off. Benita is currently exhibiting at the Brunswick Street Gallery. Bendigo will get a taste of her sculpture at the student exhibition. Her piece for the show is currently hanging in the studio foyer. It’s a collection of large sculptures, suspended like ghostly chandeliers, with a beam of projected light through the middle.